The Government has announced that the Tenant Fee Ban will come into force from 1st June 2019. This means a ban on all tenant fees will apply to any tenancies signed after this date. 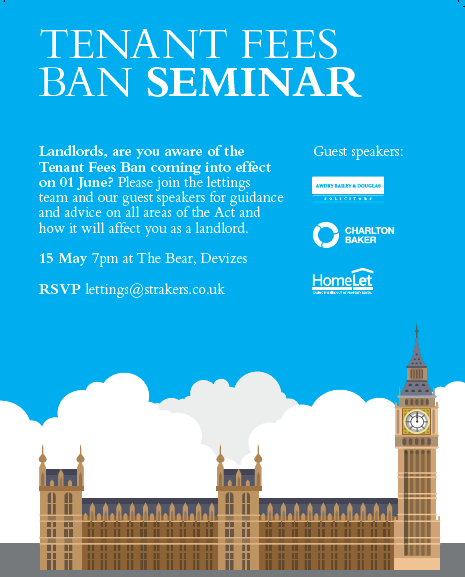 On Wednesday 15th May, 7.00pm, Strakers Lettings will be holding a seminar at The Bear Hotel, Devizes. We have guest speakers from industry experts Homelet Referencing Agency, Charlton Baker Accountants, and Awdry Bailey & Douglas specialist lettings solicitor. We would be most grateful if you could let us know if you would like to attend by RSVP to lettings@strakers.co.uk with the number of guests attending. We look forward very much to seeing you. Want to find & contact your local branch of Strakers?